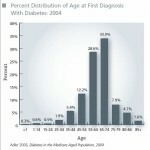 10.9 million American men age 20 and older - 10.5% of all men in this age group - have diabetes. Nearly 1/3 do not know that they have it. 10.9 million American men age 20 and older – 10.5% of all men in this age group – have diabetes. Nearly 1/3 do not know that they have it.